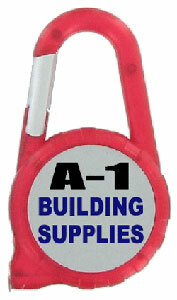 Carabiner with integrated 72" tape measure and large logo area on both sides! Price includes a full color imprint of your name, logo or message. Add $0.25 for full color imprint on side 2. Need more than 2500 pcs? Please contact us for best pricing! Made from durable plastic with carabiner style gate and a very generous imprint area for a full color custom imprint. Tape measure carabiners conveniently clip to straps and loops via a spring loaded "carabiner" style gate. The tape measure pulls out to 6' and units marked in inches/feet and mm/cm. Tape measure carabiners with a custom full color imprint of your name, logo or message make exceptional promotional products. Promotional carabiners are no load bearing and not for climbing.